Favorite Independent Trans-Am Driver ??? Re: Favorite Independent Trans-Am Driver ??? 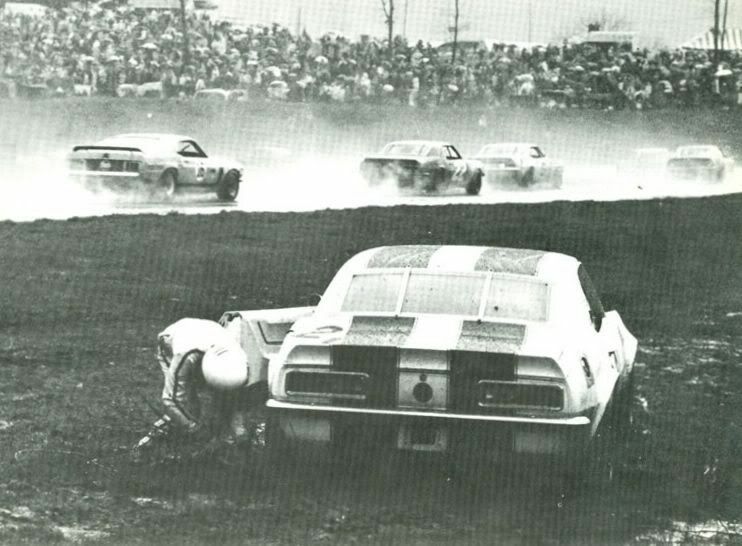 Hey Bob how would you know you were too busy backing down escape roads to see what was happening on the track (LOL) !!! Joe, I have not asked Warren about that. The 427 car falls into a different class than the 5 liter cars so I'm not sure that it would be comparing apples to apples. get back on the track - it was an "anxious moment The next two times I must have gotten braver with late braking into one. I'm sure Al was having a heart attack in the pits during my "excursions". Yes I think your right Bob that was the day where I pulled you aside before the start of the race to explain that the check I had written to Goodyear for new rain tires wouldn't clear unless we did well in race ............ Anyway our little chat must have worked because that day you had an awesome drive in very nasty conditions . At least when he went off the track it was on the escape road. A whole bunch of other guys didn't have it so lucky in that race. Yes we were lucky and as your image clearly shows the weather that day was atrocious, but unfortunately we were pitted at far end front straight so we had front row seats to Bobs numerous off track excursions. Next to Bobs driving for me the other high-lite that weekend getting to meet Chris Economaki "The Dean of American Motorsports." ......... Chris was the track announcer that weekend and he made it a point to take the time to introduce himself to all the teams that were racing that weekend, which I thought as a very thoughtful gesture. A race car with deluxe interior?!?! Deluxe door panels anyway. The T/G Firebirds had deluxe door panels also. I'm voting for this not because I know what I'm talking about, but rather because he's in one of my most favorite T/A cars. In fact, I don't even know if it was Trans Am or some other class. 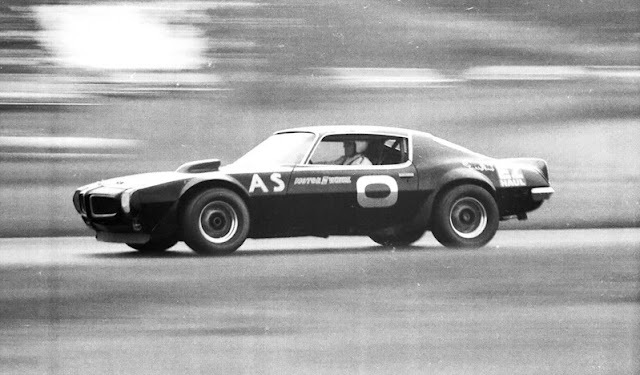 Milt Minter; driving the successor to the Gray Ghost Tempest seen up top and built by Herb Adams Racing Associates, it was the "last hurrah" for Pontiacs 303 RAV/Super Duty program, and he was part of it. This car famously/infamously holds the record for the best finish Pontiac ever achieved in a series it made such a timeless name from.